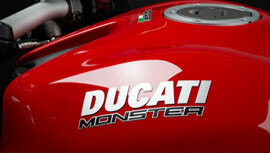 We are happy to announce the introduction of the Monster 821 range at Ducati Manchester UK. A bold and essential form shaped by a unique history, combined with the unmistakable Ducati roar released from the 112hp Testastretta 11° engine, are hallmarks of the Monster 821. 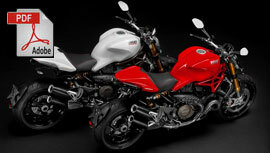 Trellis frame, Riding Modes, and the Ducati Safety Pack are the elements that bring you unprecedented riding pleasure. Monster 821. Designed according to your desires, to be even more Monster. 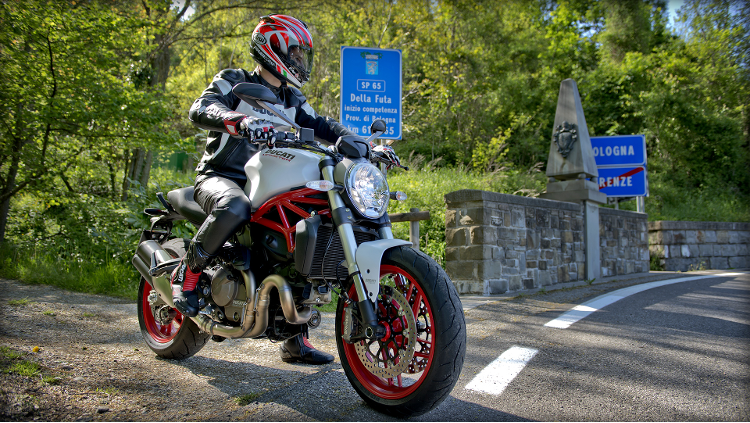 Come and test ride the 821 Monster at Ducati Manchester. 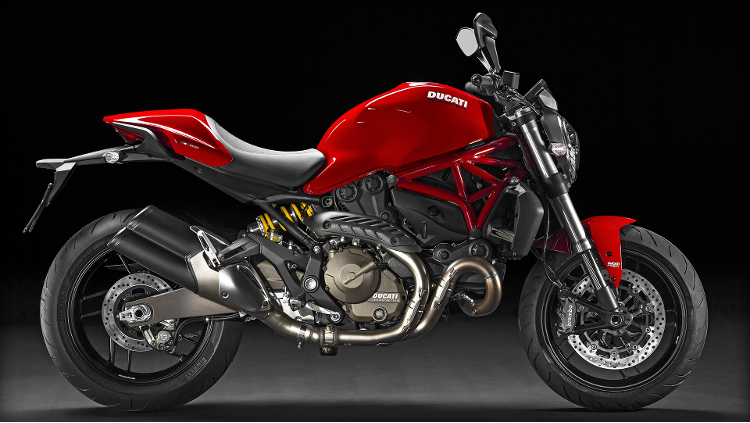 More Monster than ever, the new Monster 821 is ready to inspire. 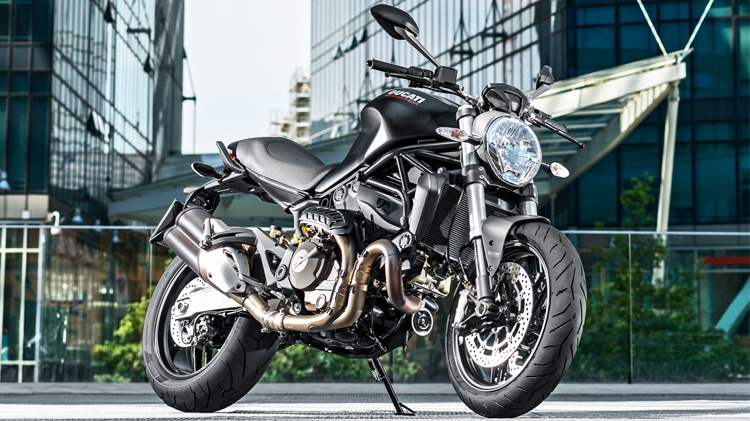 It takes just a glance to see all of the elements that contribute to creating the legendary Monster: the muscular, sporty line, the rounded front headlight flanked by the forks, the high number plate, the compact yet imposing metal fuel tank. The unmistakable "minimalist" design that gives you the impression of being in front of an engine, a frame, a tank, a seat, and nothing more. 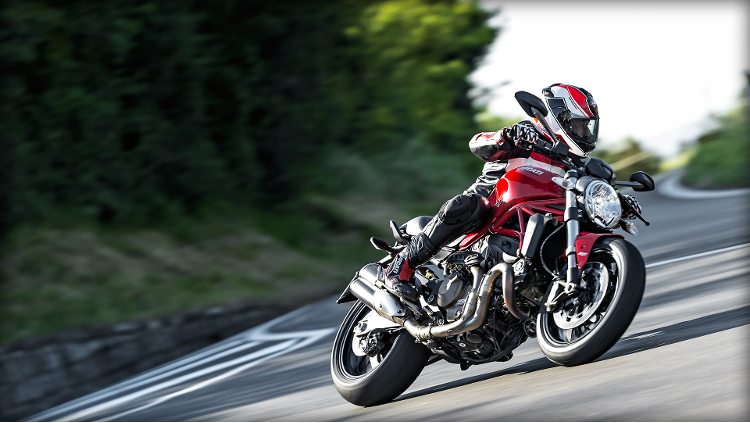 Despite its larger size, which offers unprecedented performance and versatility, the Monster's proportions immediately reveal the heart of a sports bike. The mass is visually concentrated at the front and the engine area looks compact, even with the new water cooling system, into which the radiator and the water supply pipes have been cleverly incorporated. The engine is combined with an impressive side-mounted staggered exhaust system that leaves no room for doubt about the bike's performance. 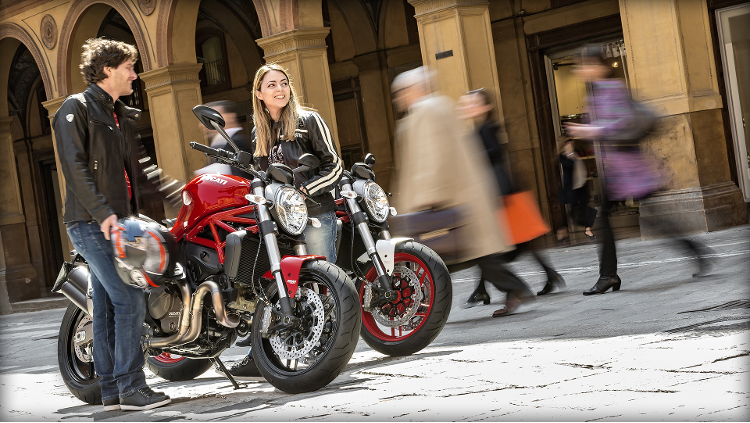 The new Monster 821 clearly spells sophistication, modernity and substance thanks to its avant-garde technology and top-quality materials. 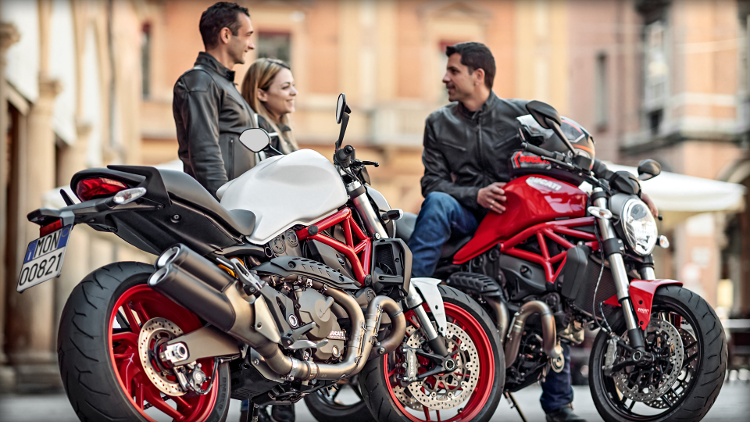 Ducati's traditional trellis frame has evolved, using a typical sports bike solution, in which the engine is the supporting element. 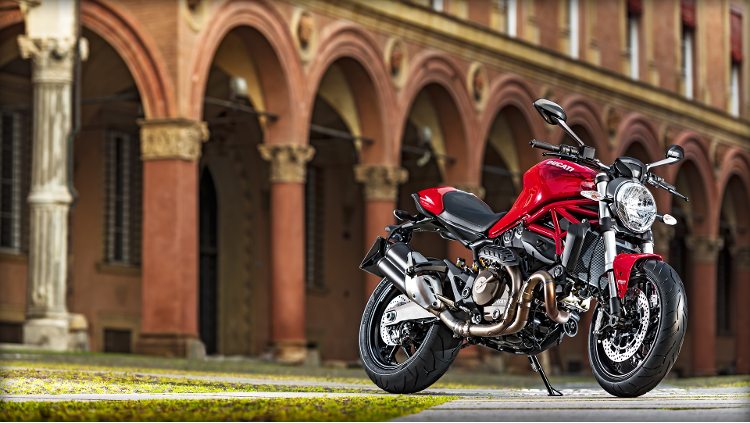 The imposing metal tank in pure "Monster style" helps to define a superior class of bike. 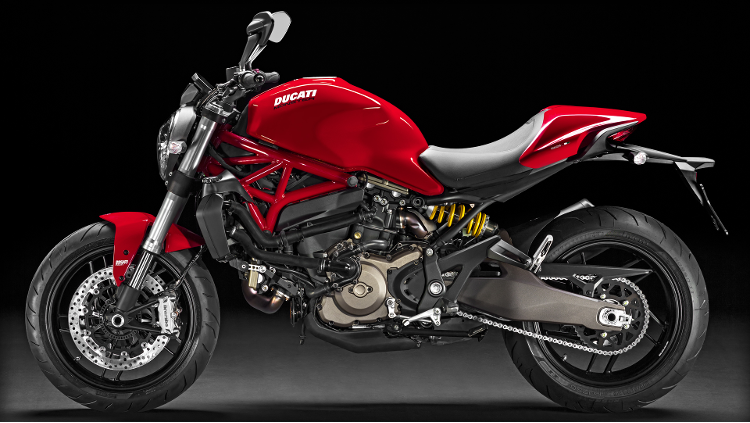 The 2015 Monster 821 is now available at Ducati Manchester. 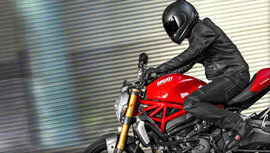 We also carry a large selection of other new & used Monster models. 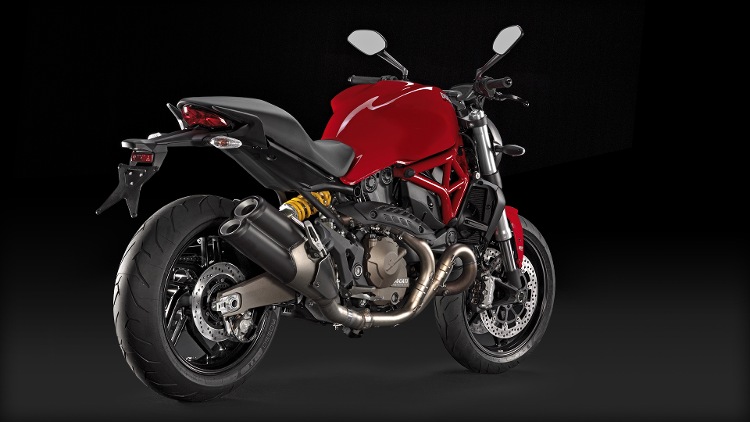 The Monster 821 is powered by the Testastretta 11° 821 cc engine, with air injection system. 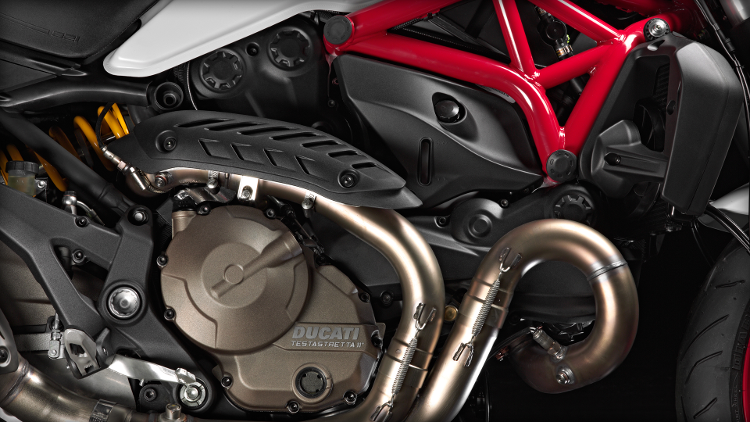 A secondary air system similar to the one used on the 1199 Panigale has been introduced in order to optimise operation and reduce combustion cycle variability, without affecting emissions. A controlled flow of clean air is injected into the exhaust pipe, enabling total oxidation of the hot exhaust gases, efficiently cutting hydrocarbon and carbon monoxide levels. 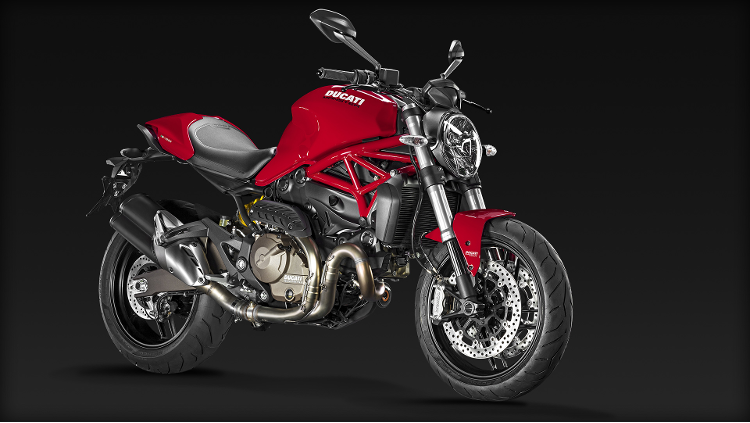 The Testastretta 11° engine fitted to the Monster 821 is an exclusive feature of these bikes and its structure has been engineered to be an integral element of the frame. In addition, the air filter and exhaust system have been designed to provide improved torque at low-medium engine speeds. The Testastretta 11° 821 cc engine generates power equal to 82.4 kW (112CV) @ 9,250 rpm and 89.4 Nm (9.1kgm) of torque at 7,750 rpm. 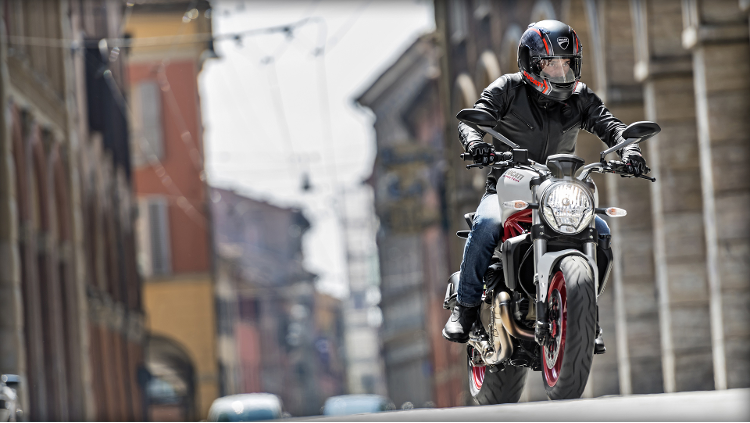 The Testastretta 11° 821 engine is combined with a type 2-1-2 exhaust system, which leaves no room for doubt about the performance that the new Monster 821 is capable of unleashing. 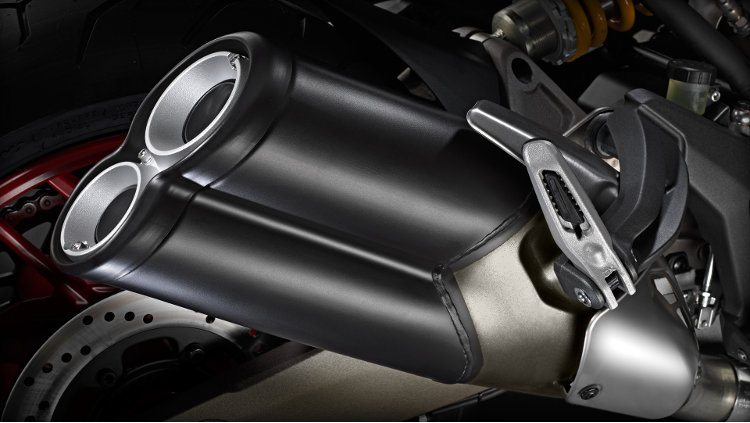 The engine control unit has a lambda probe for each individual cylinder, guaranteeing delivery of the right amount of fuel, while the stylish vertically stacked cannon silencers are equipped with catalytic converters that ensure compliance with Euro 3 standards. An electronically controlled mid-section adjustment valve optimises exhaust pressure according to engine speed. 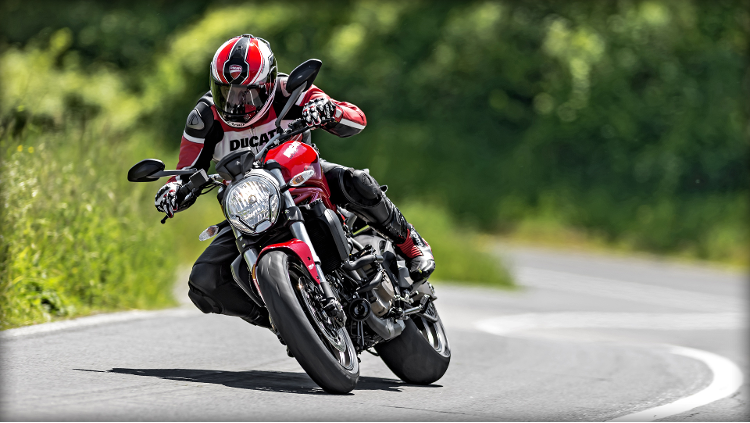 The front brakes of the Monster 821 have high-performance, pump-activated Brembo monobloc M4-32 radial callipers, equipped with high-calibration multiple 9MP ABS as standard. The four-piston front callipers, fitted radially, act on 320 mm discs, while the Brembo two-piston rear calliper is fitted on a 240 mm disc. 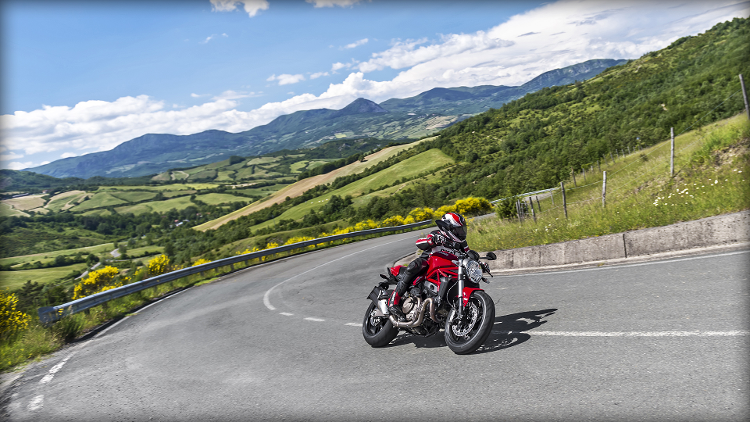 The designers of the new Monster didn't focus solely on achieving excellent performance, but also on guaranteeing a high level of safety for the rider and passenger in all driving conditions. 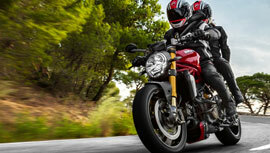 This second goal has been achieved by providing the Monster 821 with the Ducati Safety Pack (DSP) as standard, along with the 9MP ABS system and the 8-profile Ducati Traction Control (DTC).